Well that’s it. The system is completely off the telescope. The NAS with the WFS and VisAO is safely packed away in the Aux, as is our intrepid Clio. The ASM is all wrapped up on the floor of the Clay dome, ready to be trucked down the the cleanroom tomorrow. If you’ve seen the last several night’s posts, you’ll be up to speed on the comings and goings of our new friend Hedwig, a Magellanic Horned Owl that has been using the all-sky camera as a night time perch. To try to make sense of the somewhat distorted perspective the all-sky gives us of our friend, Katie and I headed down to the area near the Swope telescope where the camera lives to check it out. The home of the all-sky owl perch. Astronomer for scale. The all-sky camera sits on top of the pole you see above the building. Seeing it up close puts the size of the owl talons in perspective. Hedwig has a nice view of the Magellan telescopes from that perch. Magellan lit by the setting sun. 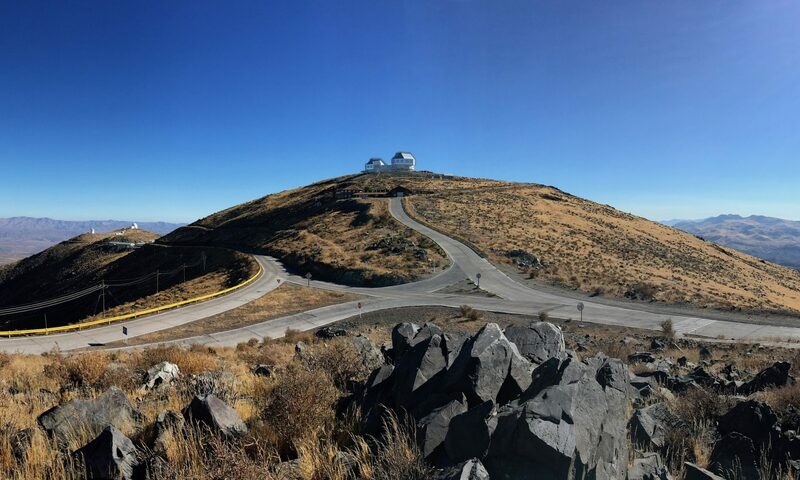 The all-sky camera is near a bunch of robotic telescopes. We watched these two open for the night. Jhen posted some pics from our GMT tour. Here’s another one, which captures the almost lush look of the place after this winter’s precipitation. Povilas is insisting that it’s just like Ireland. LCO proper as viewed from the GMT site. Click to enbiggen. A panorama of last night’s sunset sky as I walked up the hill. Click to magellanate. Katie watches the sun set over Hedwig’s domain.